Morgan E. Clay, B.A., M.S., D.M.D. Dr. Morgan E. Clay was born and lived in Beckley, West Virginia and at age twelve moved to Vero Beach, FL in 2002. She attended grades 7-12 at Saint Edwards School and then continued her education at Rollins College where she graduated in 2012 with her Bachelor of Arts and Science in Biochemistry. She then attended the University of South Florida where she completed her Masters in Biomedical Sciences in 2013. 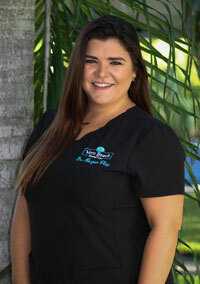 In the spring of 2013, Dr. Morgan Clay was accepted into LECOM School of Dental Medicine in Bradenton, FL. She spent the first three years of school in Bradenton and then worked at an outreach clinic in Defuniak Springs, Florida her fourth year, before graduating in June 2017. She joined Vero Beach Dental Care in June 2017 to practice with her father, Dr. Roger Clay in his practice that was started in 2003. While attending dental school, Dr. Morgan Clay as an active member of the Florida Dental Association (FDA) and the American Student Dental Association (ASDA). She volunteered frequently at the Florida Missions of Mercy and Remote Area Medical events where she performed various dental procedures at no cost to patients. In order to better serve her patients, Dr. Morgan Clay continues her education through advanced courses in both general, cosmetic and sedation dentistry. It was always her dream to work side by side with her father, Dr. Roger Clay, and together they are dedicated to providing their patients with the highest quality care available in the most comfortable way possible.